The past few weeks have been insane schedule-wise. First of all, I had a slew of administrative concerns that needed to be sorted out. Never fun. Secondly, I had to take a Foreign Language Proficiency Exam. In Spanish. So why did I have to take it? Well, long story short, for my degree, I basically needed to show that I can do research in a language other than my native one if necessary. Since I am in a French department, French doesn’t count even though it is not my native language. English doesn’t count either because it actually is my native language. Yes, I agree; it didn’t make a whole lot of sense to me either that I had to pick something else. What is really embarrassing is that I have actually known about this requirement for years. Why did I put it off for so long? Well, it kept getting superseded by more pressing things like students who needed final grades, or coursework that needed to be completed. Silly things like that! I think that I also had these pleasant daydreams of jetting off to Buenos Aires to learn Spanish while sucking down copious amounts of Malbec. Or learning Spanish in Madrid with a dictionary in one hand and a tapas in the other. Or going to Lima and eating chifa until I exploded. You get the idea. In any case, it just got to the point where I couldn’t avoid it anymore. And that is how I found myself in a situation where I had to teach myself advanced-level Spanish in three weeks! To those who say that Spanish is “easier,” I say that you don’t know what you’re talking about. I have spent many, many, many years teaching French to undergrads. That is a lot of experience breaking language down into manageable chunks and patterns. Believe me when I say that, comparatively, Spanish has a lot more verb forms than French does. It also has more than one verb for “to be,” a crazy, confusing thing called the “a personal,” and imperfect past, past perfect and future subjunctive tenses that actually get used. I would guess that people say that Spanish is easier for two primary reasons: Americans tend to have more exposure to Spanish than any other foreign language, and Spanish-speakers, in general, seem to be much more tolerant of badly-spoken Spanish than French or Italian speakers are of badly-spoken French or Italian. Needless to say, I was so stressed out I wasn’t eating very well. However, at a certain point last week, I just couldn’t take it anymore. My body would not accept any more slices of pizza, any more handfuls of almonds, or any more weird juice drinks in an effort to have my fruit and vegetables in a speedy, non-chewable way. I just had to cook something. It had to be warm and comforting. It had to be interesting too, but in as fuss-free a way as possible. A roast chicken fit the bill beautifully. Trussed tight, massaged with butter, and showered with salt and pepper is all the effort needed to turn out a beautifully golden bird. But woman cannot live by poultry alone! So I paired it with this fantastic Parmesan rice recipe that I adapted from Yotam Ottolenghi — which was equally as easy to make, as well as being elegant to look at and eat. Is the dish Middle Eastern-inspired? Persian? Moorish? Italian? Turkish? Who the heck knows, but it was delicious. As for the exam, I hope that I passed! I find out in 4-6 weeks. Fingers crossed that I don’t have to take the gosh darned thing again! 1. Melt 2 tablespoons of butter in a medium-sized saucepan over medium heat. Toss the rice in the melted butter until the individual grains become translucent. Add 3 cups of water and a good pinch of salt. Raise the heat to medium-high, and bring the rice to a boil uncovered. Cover the pan, and lower the heat about as low as it can go. Cook the rice until all the liquid has been absorbed and the rice is tender. 2. When the rice is done, fluff it with a fork. Evenly sprinkle the rice with the cheese and stir everything together. The Parmesan should be evenly distributed throughout the rice. Adjust the seasoning with salt and white pepper. Cover the rice again while you prepare the almonds. 3. In a small frying pan, melt the remaining 3 tablespoons of butter over medium to medium-low heat. Once the butter has melted, add the almonds. Turn the almonds in the foamy butter until they begin to brown and turn golden. Remove the pan from the heat. VERY CAREFULLY add the lemon juice by pouring it over the back of a wooden spoon into the almonds. Stir in the oregano leaves. Adjust the seasoning. 4. Mound the Parmesan rice in a large dish. Spoon out the almonds and pour the sauce evenly over the rice. Sprinkle with sumac and serve with roast chicken. This is not a recipe per se, but more like a set of guidelines that I have used over the years for cooking perfect poultry. 1. Buy the best bird you can find. Organic, all-natural, free-range, no hormones or antibiotics, humanely-raised and processed if you can. 2. Take your chicken out of the fridge about 30 minutes to an hour before you want to cook. Your bird should be on the cool to touch (like the cooler side of room temperature), but not refrigerator cold. 3. Dry your bird throughly with paper towels, inside and out. Let it sit on the countertop uncovered. The dryer the skin, the crispier the chicken. 4. Pre-heat your oven to 425-450°. Give yourself some time for the oven to come up to temperature. This generally takes 15-20 minutes, but can take up to 30 minutes depending on your oven. 5. No stuffing. This is the secret to perfect chicken. I find that by the time the stuffing is done cooking, you have overcooked your lovely bird. I like just a few things in my chicken: one lemon (cut into wedges if your chicken is small), one onion, a few cloves of garlic and fresh thyme. If it’s Meyer lemon season, please do use one of those. 6. Use the best butter or olive oil. In Nigella Lawson’s cookbook, How to be a Domestic Goddess, she writes that when roasting chickens, you should anoint your chicken with the highest quality butter or olive oil the same way you might apply very expensive hand cream. I always liked that image. 7. Truss your bird tight. Like a compact little football. I really do think it helps your bird cook more evenly. Moreover, chicken just looks better without its legs all akimbo. 8. Season liberally. In his Bouchon cookbook, Thomas Keller writes that he never butters his bird because the moisture in the butter creates steam that will ruin the integrity of the skin’s crispiness. I’ve never found that to be the case. So by all means, hold your hand high and shower that bird with seasoning! 9. 20-20-20-15 or 15-15-15-15. I don’t always follow this but when I do, I like the results. Inspired by Patricia Wells’s Roast Lemon Chicken recipe in her Paris Cookbook, I start the bird in a super hot oven on one side. After twenty minutes (or 15 if the chicken is small), I turn it on the other side for another twenty. After that, I drop the oven temperature to 375°. I turn the chicken breast-side up for yet another twenty minutes — a total of 1 hour. I continue roasting it until the chicken’s internal temperature reaches 165°. When the chicken is done, the juices should run clear when you pierce the thickest point of the thigh with a paring knife or skewer. Sometimes, I will just put the chicken in breast-side up at 425-450° for about half and hour to 40 minutes before dropping the temperature to 375° for the remainder of the time. I know it sounds weird, but I think you can start to smell when you should turn down the heat. I find the results to be almost as good. 10. Remove from oven and let rest for 10-30 minutes before carving. Such an important step and essential for serving a juicy bird. Plus, you don’t risk burning your fingers! A top-knotch carving knife is always an asset in the kitchen. Keep the carcass and the juices! They are worth their weight in gold. Sounds like a great tasting meal. 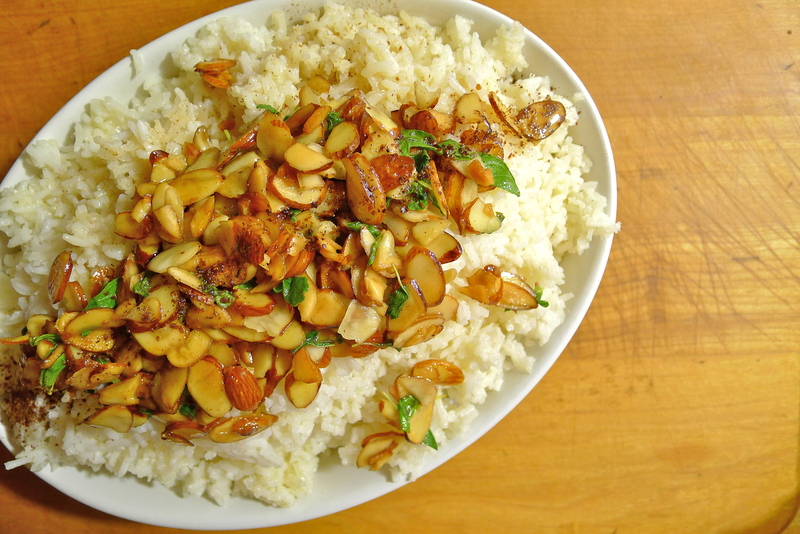 I like the idea of the cheese and almonds in the rice dish. Hope you did well on your test. Thanks for the good wishes about the exam! Fingers crossed! Sent from my iPhone. Please excuse any typographical or grammatical errors. Those almonds look incredibly tasty. I’m ashamed to say that I buy large bags of almonds at Sam’s Club and woof them down by the handful. Your pictures of the almonds makes me want to get into the car (in my pajamas and messy ponytail) and drive 35 minutes to Bangor to shop at Sam’s. Please don’t eat chifa until you explode or drink anymore weird juices. I like reading your blog and I want you to live. I adore shopping in bulk. I wish that there was more room in my kitchen for it! But when I go home to visit my parents, they seem baffled about how excited I get about gallon containers of Hellman’s, 20 packs of socks and white tee-shirts, and 10 pound bags of jerky. If I go eat chifa, I have decided that you are coming with me! Because how else am I going to stop unless someone stops me?! I’m hopeless I quit French at 13 (as soon as I could) so I rely on my other half if we’re in France and just hope people speak English everywhere else! That’s a beautiful roasted chicken! I also like the idea of buttered almonds. Thank you! The buttered almonds were so yummy! 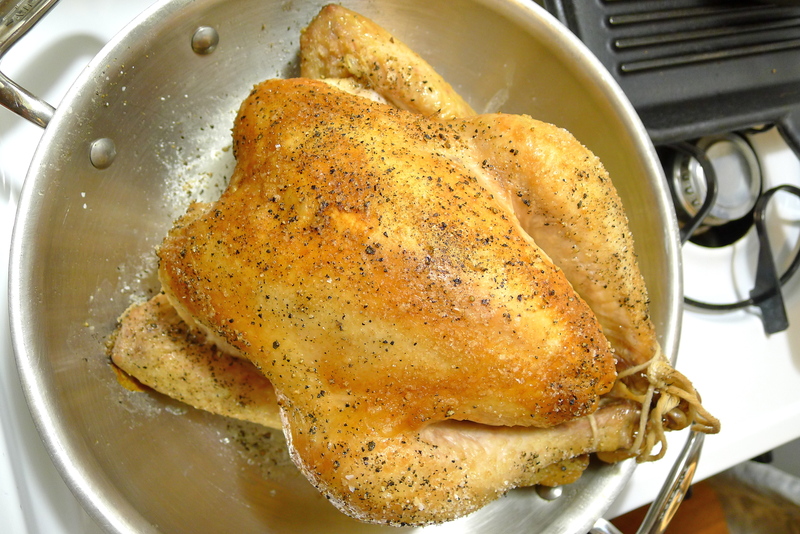 Like you, I have been COMPLETELY converted to Thomas Keller’s roast chicken method (I never do it any other way) but also like you, I think it’s oh-so-much-better if you rub the skin with soft butter (or even olive oil) before seasoning. In a hot oven (even better: convection setting) the skin still comes out gloriously crispy. I never roast chicken any other way now. Love this rice dish, too. Good luck with the exam! I wish I had a convection oven! When I go home to visit my parents, my mom thinks I’m a little crazy because I want to roast and bake everything. But the heat is so even! Thanks too for the well-wishes about the exam. I hope I did okay too! Smell-O-Vision! Now that is the iPhone feature that I am waiting for! The Apple iPhone 6GS. S for smell! Who knows? Maybe in a few years it will be possible to record odors � only good ones of course! Until then, take my word for it, it was crispy and divine! I wish I’d read this post before I roasted a chicken last. My bird was frozen and I didn’t thaw it properly so it took an eternity to cook through. If I had made sure it was close to to room temp, it would have been much better. I’ve never been a fan of breast so I saved that and some vegetables, diced and mixed it with orzo and mayonnaise the next day. The better way to eat chicken breast I think. And I always make gravy out of the pan juices. I adore gravy and await the day when serving it in a bowl as soup with bread on the side will finally be acceptable. Oh yum! I like the idea of mixing leftover chicken with orzo and mayo! What a great idea! Gravy is awesome. I actually do think it is acceptable to serve it in a bowl as soup! Why not? My favorite thing to do with the pan drippings is to skim off the fat (use it for roast potatoes), and use the rest for a pasta sauce. No waste in this house! Thanks, Malou! The Parmesan rice was delicious! I think that I will probably make more buttered almonds next time. Almonds fried in butter are addictive!